Mahashivratri, “the great night of Shiva“, is one of those festivals that I looked forward to as a kid …it allowed us to forgo the healthy veggies and pulses in meals for much tastier sweetmeats and special dishes…praying and fasting like adults never ever featured in the year long wait for the auspicious day. Celebrated on the 14th day of Phalgun month(February-March) of Hindu lunar calendar before the advent of spring, Mahashivaratri has different legends associated with its celebration. While some associate it with the night when Shiva married Goddess Parvati, some go with the story of Shiva performing a celestial dance of creation, preservation and destruction of evil forces. Another story has Shiva consume poison that emerged during churning of oceans and threatened the destruction of world. All the stories have the common concept of ‘Creation and Preservation of the World’. Mahashivaratri is the most important festival related to Shiva and the devotees hope to imbibe Shiva’s virtues of self-restraint, forgiveness and upholding the truth without causing harm to innocent. Though whether the celebrants succeed in discovering Shiva and ethical living is debatable…. The most common depiction of Shiva is as a ‘Lingam’ but there are about 64 forms of Shiva’s iconography. While growing up in various cities of Uttar Pradesh I usually saw Shiva depicted either as ‘linga’ or as a blue idol accompanied by his consort Goddess Parvati and son Ganesha. It was however on the exterior walls of temples in Tamilnadu that I was introduced to various other forms of Shiva. Derived from ‘Lingam’ (column) + ‘Udbhav'(appear), this denotes Shiva emerging from the formless…pure supreme energy. Shiva according to a legend, appeared before Vishnu and Brahma who were engaged in a debate of superiority, as a column of fire, the pillar of supreme energy which had no beginning and no end. Shiva advised both Vishnu and Brahma to find the beginning and end of the fiery column…the one to succeed considered superior. Vishnu proceeded to find Lord Shiva’s feet while Brahma sat on his Swan to find the head of the fiery pillar. Vishnu failed to find source of energy and returned to apologize whereas Brahma even after having failed to locate the end of the energy, claimed to have succeeded. Brahma’s lies infuriated Shiva who cursed Brahma and as punishment declared that never would anyone pray to Brahma. This form of Shiva could very well have been the origin of worshiping Shiva as a ‘lingam’. Depicted as half man and half woman, Shiva in this form represents the union of masculine and feminine energies of nature….the purush and prakriti. Mythology says that Goddess Parvati requested Shiva to be reside within him as one and the ‘ardhanareshwar’ form was created. According to another story, Brahma created the world but it seemed to stagnate…there seemed no way to increase the population and the world seemed dull with absence of females. It is then that Shiva created the ‘ardhanareshwar’ form to enlighten Brahma about the flaw in his creation. Shiva created the female half of the world. Somehow this story resonates with the story in the Bible of creation of Eve from Adam’s body. This form of Shiva again about the creation of the universe…that the male and female are inseparable and act in unison to create the cosmos. I hope this mahashivaratri, we understand that women are no less to men and their presence is as important in all aspects of society…I hope no woman is chained and bound in dos and dont’s…I hope women will be as free as men in making their choices and taking their own decisions.. This is the fearful manifestation of Shiva…the destroyer…the annihilator. Shiva destroys the demons of ego, lust, greed, fear and vengeance in this form thus again preserving the world. Shiva in his this form destroyed Brahma’s ego. Brahma considered himself the sole creator of universe and had begun gloating in his handiwork. Shiva created the form of Bhairava from his nail and cut off the head of Brahma….thus killing the evil ego that threatened to rear its head in Brahma. Bhairav is usually shown with his vehicle a dog and wears serpents as his ornaments. Bhairava form of shiva is the protector of ‘Shaktipeeths’ or the temples dedicated to supreme feminine Shakti..the Goddess. The ‘king of nata’…drama….maya..Shiva is the supreme dancer…the king of dance and ‘natya’ or drama. He in this form is an ecstatic dancer who creates and rejoices. 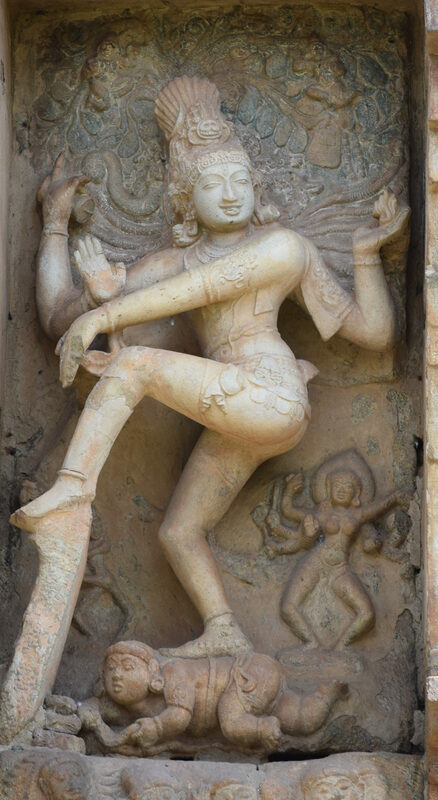 Nataraj form of Shiva is also seen in Ellora and Badami caves. Shiva stands on the demon depicting ignorance and dances in a circle of cosmic fire that in Hinduism creates and consumes everything in a life-cycle. A fascinating story describes the dance competition between Shiva and Parvati. Parvati matches every step and energy with Shiva’s dance. However, when Shiva lifts up his leg high above, Parvati bows out and accepts Shiva’s superiority in dramatic arts. Shiva thus gains the title of ‘Nataraj’. Shiva creates his own music with his instrument ‘damru’. He strikes a pose to assure freedom from fear and a promise to lead to salvation. Awesome post, contains lots of infos and very nicely written, loved reading this. Thank you Jyotirmay. I am glad you liked it.